A discussion has been opened on this meditation. To contribute further to the discussion, please use the Contact form. 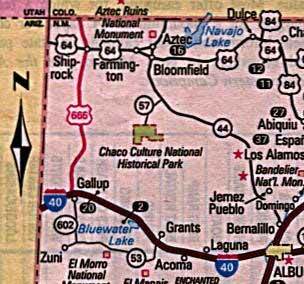 Highway 666 used to wend its way through north-western New Mexico up into Colorado and Utah. The road was assigned that number back in 1926, just standard highway numbering in the USA as the planned sixth branch off Route 66. Colloquially, due to its number, it became known as The Devil's Highway. Now, after three-quarters of a century, highway 666 is no more. Too many people complained about the number giving the road an evil connotation. So, last year the politicians changed the number. So what's the problem? The passage clearly refers to the number of a man, not the number of a highway. And changing the number of the road changes nothing. It's still the same damn highway. What we see here is simple foolishness arising out of misinterpreting religious teaching, It's bad enough that there are idiots who try to interpret Revelations literally without adding this level of nonsense. What's next? Changing the page numbers in books to ensure there is no page 666? (This would get rid of Ezekiel 29 in my bible.) Are we going to see the same superstitious nonsense which we see in tall buildings - skipping from the 12th floor to the 14th? While some Christians want to ban use of certain numbers, others are trying to change the language. They want to eliminate the word "hello." Why? Because it contains "hell." And they want to replace it with "heaveno." In fact, in 1997, the commissioners of one Texas county actually passed a resolution making it the official courthouse greeting. Now, we have total ignorance coming into play. "Hell" has nothing to do with the etymology of "hello," nor is it part of proper pronunciation of the word - which is pronounced "he-lo" not "hell-o"
Yet no-one is forced to use the word. There are already lots of alternatives - Hi, Hiya, Hey, Good morning, Good afternoon, Good evening, 'allo, 'ullo, Hullo, etc. There is absolutely no reason to introduce a concoction such as Heaveno - except for the purpose of forcing a religious viewpoint into everyday greetings. But what I find amusing is the sound of "Heaveno." Try saying the word several times - let it flow naturally. And what do you hear? "Heaven-no." The greeting turns into a denial of heaven rather than a promotion of it. They're making a public profession of disbelief every time they use it. So if any fool greets you with "heaveno," just reply, "I agree. It's highly probable that there is no heaven." Is there a message to all this? I think there is. If you attempt to ban specific words and specific numbers, you are not really eliminating them. You are just making them taboo; you are giving them a power against you, they did not previously possess. They will have that much more impact on you when you encounter them in daily life.